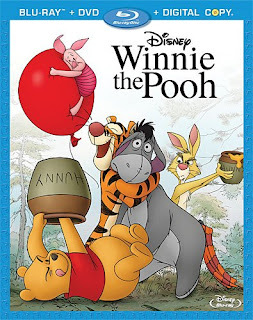 Walt Disney Pictures will release Winnie The Pooh on DVD and Blu-Ray October 25, 2011. 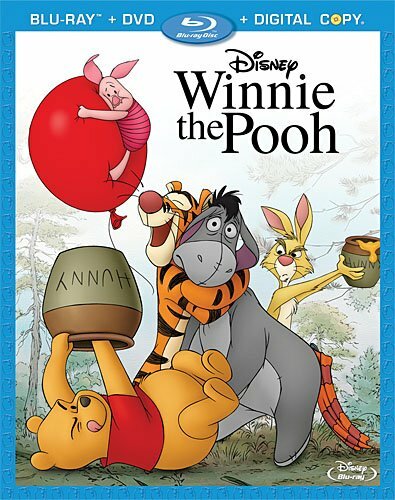 Go on an adventure in the Hundred Acre Wood, featuring the world’s beloved bear, Winnie The Pooh! Join Pooh, Tigger, Rabbit, Christopher Robin, Owl, Kanga, Piglet, Eeyore, and all of the classic characters you know and love. Below is a widget so you can have some fun. Take The Pooh Personality Quiz! An awesome assortment of games and activities for you and your family to have your own adventure! Download coloring sheets, exclusive “Pooh” cooking recipes, party ideas, crafts, games and more. 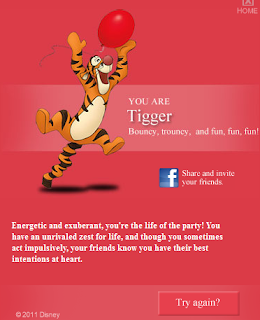 You are Tigger. Bouncy, trouncy, and fun, fun, fun! Energetic and exuberant, you're the life of the party! You have an unrivaled zest for life, and though you sometimes act impulsively, your friend know you have their best intentions at heart. I couldn't have said it better myself! Now, it's your turn to take the personality quiz. Take the personality quiz on the widget. Leave a comment below stating the character's personality that you match. Can't wait? Pre-order your copy today. Contest will end 10/29/2011 at 11:59 PM EST. Giveaway open to US residents only. You must be 18+. A winner will be chosen using Random.org. Please leave an email address or other valid form of contact in your entry. You will have 48 hours to respond before another winner is chosen. Your mailing address cannot be a P.O. Box. There was no monetary compensation for writing this post. Giveaway item provided thanks to Walt Disney Pictures. The opinions and views are my own. 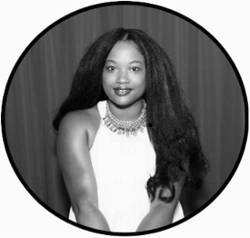 For more, check out Disclosure Information.